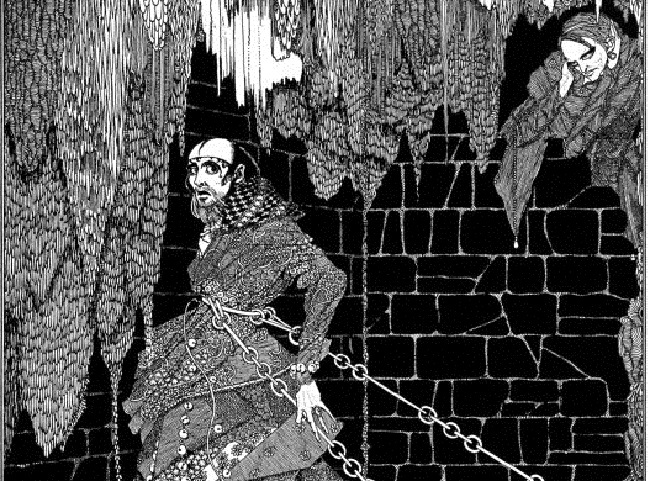 “The Cask of Amontillado” by Irish book illustrator Harry Clarke (1889-1931) for a 1919 edition of Tales of Mystery and Imagination. Image courtesy of Wikimedia Commons. The Raven (directed by James McTeigue and starring John Cusack) opens this weekend in theaters. The movie is the latest of many attempts to adapt the works of Edgar Allan Poe for the big screen; it depicts a serial killer whose methods are inspired by various Poe stories. Although none of us at The Library of America has seen the movie, we do hope that it attracts new readers to Poe’s fiction and poetry. One story used in the film is “The Cask of Amontillado,” which is not only among Poe’s most famous works but also one of the best-known revenge fantasies by any author. What is not as well known is that the story itself was an act of revenge. For several years Poe had been feuding with a former friend, Thomas Dunn English. Their quarrel began when, in 1843, Poe publicly ridiculed English’s poems; things escalated from there. Three years later, Poe sued English for libel for a letter that appeared in a newspaper (Poe won $225 in damages), and English published a novel, 1844, or, The Power of the S. F., featuring a Poe-like character named Marmaduke Hammerhead—a journalist who “never gets drunk more than five days a week,” becomes famous for publishing “The Black Crow,” grows increasingly crazy as the novel progresses, and ends up in an asylum. One of Poe’s responses to this malicious portrayal was “The Cask of Amontillado,” pitting the scheming Montresor against his buffoonish nemesis Fortunato. The author Andrew Barger has noted some of the story’s references to English’s novel, to wit: “A chapter of 1844 takes place in an underground vault” and “English uses the phrase ‘For the love of God’ in 1844 and Poe spits it back to him in this story.” The motto of Poe’s fictional Montresor family is Nemo me impune lacesit (“No one insults me with impunity”); it could just as well serve as a theme for Poe’s own career. Note: Amontillado is an expensive variety of sherry; a pipe is a cask or barrel used for wine. The thousand injuries of Fortunato I had borne as I best could, but when he ventured upon insult I vowed revenge. You, who so well know the nature of my soul, will not suppose, however, that I gave utterance to a threat. . . . If you don't see the full story below, click here (PDF) or click here (Google Docs) to read it—free! Edgar Allen Poe is known for his love of the macabre. This story is a revenge fantasy in which Poe imagines taking revenge against Thomas Dunn.Montressor whose coat of arms carries the legend," no one insults me with impunity," lures the unsuspecting but intoxicated Fotunato to his deep dark vault and immures him there. The manipulative ways of the murderer and the description of the catacombs sends many a chills down the spine of the readers.